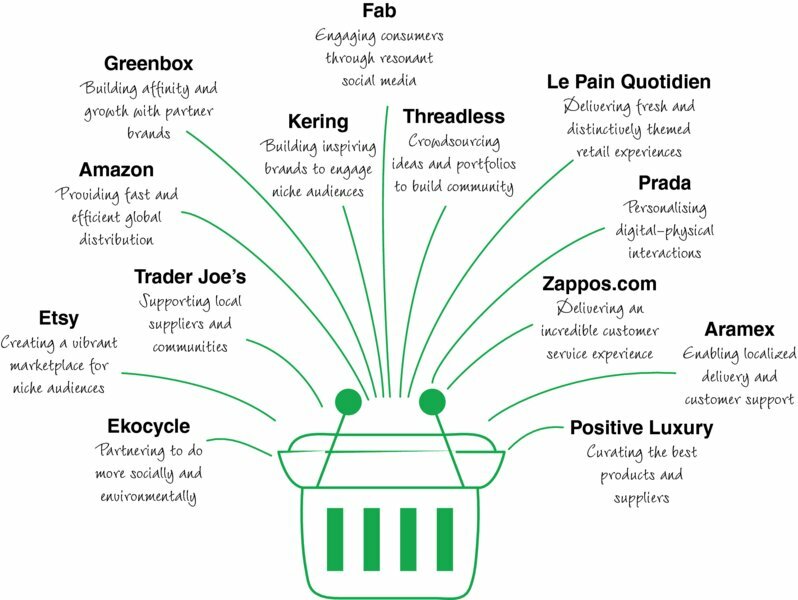 From Amazon to Etsy, ZaoZao and Zappos … through branded boutiques and online marketplaces, digital walls and mobile marketing, big data and personalized promotions … what is the future of retailing, in general, and for your business? Walking around the Burberry flagship store on London’s Regent Street, with its beautifully arranged clothes, its magic mirrors that superimpose your image in the clothes of your fantasy and place of your choice, and the VVIP room on the top floor, it is a world of imagination, where emotions not rational desire prevails. It is the work of designer Christopher Bailey who has overseen the rejuvenation of the brand from its ‘chav’ ubiquity to its super premium status. The $100,000 limited edition white alligator skin jacket, not to everyone’s taste, perhaps demonstrates this stretch. It is a brand that is truly global, more Asian than European if measured by its custom, and more digital then physical, based on the focus of its innovations. Burberry showcases the future of retail – as a niche focused, premium branded, hybrid experience. Online retail has grown rapidly over the last decade, from a marginal bolt-on, to major revenue stream in a multi-channel model. In the USA, it has grown by around 18% per year, and now accounts for 8% of all sales. But digital is more that this, it is not just another way but a fundamental capability that can enhance every channel. Search on your phone, buy online, pick up in store. Go to the store, use your phone to buy, delivered to your home. Retail innovation is about hybrids, combining physical and digital activities and options in a more experiential and valuable way. Retail purpose, formats and incentives all change – whilst loyalty cards originally drove behaviour through points, people soon became wise that the rewards were trivial compared to special offers in store. Whilst stores have enhanced their shopper experiences, markets have fragmented with more space for discounters. In Turkey, for example, BIM has taken around 40% of the food market with low price, small outlets across cities. At the same time, online players have morphed into credible alternatives, where Amazon sells wines and eBay replaces physical outlet stores. More emotionally, technologies such as Synqera from Russia can ‘mind-read’ a shopper’s emotions, judging how to best engage them as they shop and how to make them smile. Mobile is already a huge factor: at upmarket fashion retailer Gilt, 50% of shoppers and 30% of sales are by mobile. It is the glue that brings together online and offline, creating more personal experiences, from individual promotions geo-targeted, to in-store research and navigation, price checks and comparisons, as well as fast and safe payment. As newspapers are replaced by digital news, TV is on demand, and online retailers never close their doors, the way retailers engage and serve consumers changes. We expect 24-hour access, we don’t tolerate stock outs, compare prices instantly, shop beyond our borders, and demand delivery in 24 hours. Big data, the huge quantities of transactional data, mashed with other sources of personal and behavioural data through complex algorithms, means that marketing is highly personalized. Around 35% of all Amazon purchases and 75% of Netflix movie choices are based on recommendations. Of course these suggestions compete with the much more trusted recommmendations of friends and peers on social media, often valued around 10 times more highly than anything from a brand. A brand therefore needs to think laterally about how to influence communities, and give them the abilities and incentives to influence each other. Consumers also become much less tolerant of failures, unavailable products or poor service, they expect free and easy returns, and they immediately tweet their feelings, particularly the negative ones, to thousands of people like them. Together, our gamechangers show how the variety of innovations builds a future vision of retail. The demand side is led by the engaging, personal experiences – driven by the passion of Zappos, the collaboration of Threadless. On the supply side, this is about the efficiency and speed of Amazon, the reach and richness of Aramex or Etsy, and the transparency of Positive Luxury. In between is the ability to match niche segments with lifestyle store experiences, and whilst the Abercrombie brand portfolio is not without challenges, it knows how to connect. Amazon, from Dash to drones, Kindles to Zappos, uses technology to disrupt and redefine a range of adjacent industries, and then do it again, whilst adding new business models that create a convenient and personalized customer experience. Jeff Bezos laughs with a distinctive cackle. He is still the hands-on CEO, strategist and innovator, keeps a relatively low profile, but his innovations have become bolder. His Kindle Fire, significantly better than his early e-book reader, is now challenging the iPad, whilst his repurposing of books into short-read ‘singles’ is challenging the whole book trade. The development of self-publishing has helped Kindle to ‘own’ exclusive content, whilst acquisitions such as Audible (audio books, 2008), LoveFilm (videos on demand, 2011), Goodreads (reader community, 2013) and Twitch (gaming, 2014) has extended the content beyond books, and interactions beyond purchases. Zappos, famed for its customer service in selling shoes online, became part of Amazon in 2009. This heralded the way for many more types of everyday products. In 2010 more acquisitions such as Quidsi and BeautyBar added personal care, pet supplies, toys, and groceries. Whilst Amazon has acquired around 50 businesses as it has grown and diversified, it keeps the businesses small and distinctive, whilst connecting them through the retail platform. Zappos, for example, which started by selling shoes, has built a much-admired culture of happiness. In his book, Delivering Happiness, founder Tony Hsieh explains the moment when he realized women don’t buy shoes, they buy happiness, an insight that transformed his business. The $75 billion business is truly international, with versions in everything from Chinese and Japanese, to Spanish and Brazilian Portuguese. Whilst the profits from its devices and content sales have been much slower than Apple’s, Amazon has always played a longer-term game, shaping the market first, then letting the rewards follow. Bezos likes to point out the shift in power from companies to consumers, yet Amazon becomes more powerful every day. The Kindle Fire now rivals the iPad, Amazon Prime’s annual membership that gives free next-day shipping was a masterstroke, whilst the same-day grocery delivery service, Amazon Fresh, is set to transform behaviours and expectations further. And we wait to see whether the former investment banker’s vision of 30-minute delivery by mini-drones will come true. Amazon is just at the beginning of its journey, says Bezos; commenting in his recently acquired Washington Post he said ‘In a sense it’s still day one. There’s still so much you can do with technology to improve the customer experience. And the rate of change continues to accelerate’. Fab is an online curator of beautiful products. From initially targeting a niche demographic, they found that by relaunching more openly, and with a strong use of social media, they attracted a more attitudinal audience. ‘Fab is the place to discover the most exciting things for your life’ say founders Jason Goldberg and Bradford Shellhammer. Back in 2011, entrepreneur and designer were frustrated by the lack of progress of their social network Fabulis.com, which was trying to be the Facebook, Tripadvisor and Groupon all-in-one for the gay community. It wasn’t working, stuck at 150,000 users, so they decided to shut down and start again. They recognized they needed to learn from their experience, but also refocus with an almost clean slate. They reduced their team to its core, and put up a ‘Coming Soon’ notice to hopefully retain the curiosity of previous users. Three months later came their ‘pivot’ moment, relaunching as Fab.com, a flash sales site for designer clothing, accessories and homewares. Within six months they had two million users, 100 employees, and $50 million in venture funding. By the end of 2012 they had doubled their funding, and attracted 10 million users, buying 5.4 products every minute. The bold branding and clean, colourful, ever-changing page design plays to its audience. Fab’s exponential growth demonstrates how social media can drive retail, with a mobile-centred experience. Community is sustained by an ever-changing Inspiration Wall, and Live Feed where users share their desires and purchase, linking to Twitter and a user’s Facebook Timeline. The next step is physical, with flash stores opening in cities where virtual communities are most vibrant. Positive Luxury’s mission is to curate and champion an exclusive collection of stylish, responsible brands, or as founder Diana Verde Nieto puts it ‘creating the ultimate destination for people looking to live a more positive life’. What that means in practice is that people need inspiration and information about what is fashionable and innovative, but also the social and environmental impacts of the brands and companies too. This is particularly the case for luxury brands that were slower to embrace ethical practices. Consumers want good stuff, and they want to do good too. She chose the logo because of its beauty and fragility – the Large Blue was wiped out in the UK in the 1970s, thanks to new farming techniques and over-eager butterfly collectors. In 1983, conservationists started importing the species from Sweden, which with the help of 23 organizations became the most successful insect reintroduction programme in the world. ‘We believe we can all play a part in reversing environmental damage, and that making more informed choices about the brands we choose to buy can help us each to create our own blue butterfly story. In other words you get to look good and live well without changing your habits – you just have to know where to shop. And we’re doing that bit for you.’ All you have to do is look for the butterfly mark. Aussies love the outdoors, fresh and natural. So the farmers jumped on the milk floats and brought together the best of local, authentic produce from across the nation, ready to deliver direct to the door. The business model is lean and networked, taps current trends and builds community. Graeme Beevers from Mildura in Victoria grows the tastiest Aussie oranges, John Bruce produces highly sought-after Aussie beef from Cape Grim in Tasmania, whilst Michelle Wilkinson is a superstar in the mushroom world, knowing just when to pick her cups. Authentic, curated and delivering direct to your home, Aussie Farmers Direct have transformed the definition of fresh food down under. By bringing back the much loved ‘milko’, or local milkman, a network of franchisees deliver a huge selection of the best 100% Australian owned, grown and produced products every morning. Since 2006, the network has grown from three people and one milk float, to a company with 250 franchisees who provide almost 250,000 households across Australia with fresh fruit, vegetables, milk, eggs, bread, meat, seafood and more. It’s also the largest supplier of organic food. Yet there is still much potential, having so far only gained around 4% market share. The network is also investing in suppliers; for example, buying a dairy plant in 2011 that had been mothballed for 12 years in a small rural community. AFD is about personalization and community, a preferred choice for many farmers tired of the buying power of large supermarkets. Quality and sustainability come before price, recognizing that its target consumers will pay a little more for such things. It is also about advanced technologies. Most orders come through its smartphone apps, allowing easy ordering and fast delivery. Ekocycle is part of Coke’s ambition to ‘live positively’ … and Will.i.am’s desire to inspire a new generation by making old stuff cool. Through partnerships and creative design, brands can be enriched and do good. Black Eyed Peas lead singer, writer and producer, designer and innovator, Will.i.am(known as William Adams to his mother, the kid who grew up in the tough neighbourhood of East LA, and was encouraged to find music rather than a life of crime) created Ekocycle with The Coca-Cola Company. Will has a hate of waste, and Coke wanted a new platform to make a bigger difference to the world. Instead of just reducing or recycling, Ekocycle (‘ekoc’ is Coke backwards, you note) set out to create new things from old materials, to encourage any brand or individual to get involved, and start making and selling their art, clothing, gadgets or whatever. To inspire and enable young people be sustainable and, of course, cool. Coca-Cola pledged $1million start-up investment, and the first products in 2012 included special edition, made from waste, headphones from Beats by Dr. Dre, one of Will’s own ventures. The headphones, priced at around $350 are primarily made out of three types of recycled plastic bottles. In 2014, Ekcocycle launched the Cube 3D printer, encouraging people to turn their waste plastic bottles into wonderful creations, or as Will put it, into things which are ‘beautiful and better’. Ekocycle is as much about inspiration and education as simply making money. Demonstrating that sustainability isn’t about less but more, not just about reducing consumption and emissions which can feel a little tiring at times, but about creativity and innovation, finding new materials that actually work better, design that is novel, and products that are more individual. Etsy has given local markets a global reach, bringing together like-minded buyers and sellers as a passionate movement. The business model makes it fair and accessible to the smallest trader. Etsy has brought the world of local artisans and handmade crafts, vintage collectors and bored websurfers to the wider online world. Everything you might find in a local market, independent stores or Turkish Bazaar, is now accessible on Etsy. Handmade jewellery is the top seller, followed by wedding goods with oil paintings not far behind. Whilst most goods initially came from North America (in particular from Oregon and Utah, sold to consumers in Alaska and Massachucetts), Chinese and Indian goods are rising fastest. ‘Etsy is the marketplace we make together. Our mission is to reimagine commerce in ways that build a more fulfilling and lasting world. Etsy was founded in 2005 by Rob Kalin – a keen painter, carpenter, and photographer – finding no viable marketplace to exhibit and sell his creations online and other sites like eBay full of overstocked electronics and fake goods. The business charges $0.20 per listing and takes a 3.5% cut of the sales price. In 2012 membership doubled to 22 million, with 14 million people making 1000 million purchases, resulting in revenues of close to $1 billion for the online marketplace. Etsy Labs are an educational and physical showcase for small artist communities in Brooklyn and Berlin. They include free events and workshops that focus on teaching people how to make things. From screenprinting and knitting, to photography and bike repair. In an online world, they help to build creative communities physically too, and also have pop-up labs in major cities. The business model is built around a community of participants, brought together by a love of great products rather than cheap prices. Blogs and forums, apps for every platform, links to Facebook and Twitter, keep the market active 24 × 7. Reputations are crucial to both sellers and buyers, with both able to rate and review the other. The Etsy brand defines a marketplace, a community that is local and global, a movement of people with shared values, and as Kalin himself says, ‘about we more than me’. Members love Esty so much that they themselves created a niche social media site to support their community. etsylove.ning.com has over 11,400 members who love the brand and being connected to each other, driving more purchases, more livelihoods and more art. Rakuten Ichiba is one of the world’s largest online shopping malls. Founded in Tokyo in 1997, it has built a $5 billion global presence through acquisitions of complementary busineses such as Buy.com in USA, Ikeda in Brazil, Tradoria in Germany and Play.com in the UK. Rakuten is like a mainstream, Japanese version of Etsy. It’s an online mall in the sense that it creates a platform where 30,000 independent retailers set up their virtual shops selling over 1 million different products. Like Amazon, it builds up rich data-driven profiles of consumers, to anticipate needs and match them with relevant retailers. It has central warehouses from where the retailer’s goods a centrally collated and then distributed to consumers. Like eBay it has an auction facility. This business model is sometimes referred to as a ‘B2B2B2C’ model, just like a physical shopping, where retailers are charged a site lease fee, but also commissions on sales. Tatsuya Abe is Japan’s crab-meat king. His Yamato seafood company based in Shiogama offers the best-quality seafood, in particular the local favourite Alaskan and Russian taraba crab. However his wealthy consumers are niche and dispersed, making the investment in stores unrealistic. Instead he set up a virtual store on Rakuten Ichiba and was able to deliver his premium crab meat overnight. From initial monthly sales of ¥130,000 (around $1500) he has grown his business, through online brand building, to ¥40 million ($45,0000) per month. The company’s intent is ‘to create the number-one internet services company in the world’ through continuous innovation, building on the 77 million consumers, who are attracted by online shopping and banking, to investments and travel, entertainment tickets and golf-course reservations. CEO Hiroshi Mikitani sees two big challenges for Japanese to become a global business – adopting English as the practical language of the world, and getting over Japan’s sense of national superiority, which he believes is increasingly isolating many Japanese businesses. At the same time, Mikitani has made it his mission to give economic hope to small traders across Japan, saying there are so many merchants who could have gone bankrupt without his business, including the entire kimono industry. Amancio Ortega likes to say ‘fashion is like selling fish’. Fresh fish, like a freshly cut jacket in the latest colour sells quickly at a high price. An old catch has to be discounted or thrown away. ‘Selling fish’ has made Inditex one of the world’s largest clothing retailers. From the first Zara store in the Spanish fishing port of La Coruña, opened in 1975, Ortego has added almost a hundred companies designing, making, and distributing the latest fashions. It has made him the richest man in Spain, and third in the world; with 6200 stores worldwide, and brands ranging from Bershka to Pull and Bear, Mango and Zara. Zara achieves speed and efficiency through an integrated system of design, production, logistics and distribution which also keeps stock minimal, and the store range evolves almost weekly. Employees also convey a continuous flow of shopper information, what they try and buy, and why they don’t. The 200 person creative team each has direct links to a store around the world to ensure insights are captured directly and quickly, and the brand anticipates and responds to the latest trends. Whilst competitors make clothes in distant low-cost markets, Inditex values the speed and proximity of Spain, Portugal and Morocco. New designs arrive every three days in stores, often in the same week as similar designs appear in magazines or fashion shows. They sell out quickly, usually at full price, and consumers come back weekly to see what’s new. However Inditex’s centralized structure, now controlled from The Cube head office in Arteixo, a small fishing town in northwest Spain, is both a strength in Europe and a weakness in other parts of the world. Whilst a $324m Fifth Avenue flagship store has been successful in New York, Zara with its tight slim-fit has struggled in other parts of USA. China is now the second largest market with over 150 stores. Fast, yet standardized, fashions work less well around the world. Trader Joe’s curates to simplify and humanize. With less it can do more, bringing its personality to life through discovery, humour and storytelling while at the same time caring about community, environment and good value. Trader Joe’s calls itself a neighbourhood store, yet boasts 350 locations and $8 billion in annual profits. Unlike most stores sprawling with 50,000 or more items, curation is key here, with less than 4000 different products on the shelves. Careful selection helps the chain generate $1750 per square foot, twice as much as Whole Foods. Joe Coulombe was the original Trader Joe, and having started out as Pronto Market convenience stores in 1958, moved to his own name two decades later. Joe did things differently, and his stores reflected his love of Hawaiian beach culture with walls decked with cedar planks and staff dressed in cool Hawaiian shirts. Most importantly, he started putting innovative, hard-to-find, great-tasting foods in the ‘Trader Joe’s’ name. Value mattered to Joe. And the premium, exotic specialities he brought together were complemented by his low-priced own-label ranges which combined quality and quirkiness. In 1979 Joe sold his brand to Theo Albrecht, better known for his low priced Aldi food stores in Europe. Aldi and Joe both believed in keeping things simple. No discounts, points cards, or members’ clubs. With a limited range the store drives a better supply deal in return for bigger volumes, and quickly drops unpopular items. Storytelling is everywhere at Trader Joe’s, from the hand-written signage and rustic displays, to the free coffee and sampling, the radio ads and chatty check-out dudes. Whilst most stores focus on automation and speed, this store is real and human, worth coming just to chill out. Even if you never get to visit a store, sign up to the Fearless Flyer online. With off-beat stories and cartoon humour, unusual recipes and showcased products, it’s an intriguing read. Le Pain stands out in a cookie-cutter world of standard formats as authentic and sustainable, human and communal. Whilst the world becomes anglicized, it’s great to see a little French on our streets, albeit Belgian. Le Pain was founded in Brussels in 1990 by Alain Coumont, and is now famed around the world for its organic breads, coffee bowls and long wooden communal tables. As a young chef, Coumont was unhappy with the quality of local bread, so he began making his own sourdough loaves. He furnished his cafés with pieces from antique stores and flea markets. The bakery became a restaurant, most famous for its tartines (traditional, open-faced sandwiches). ‘Whenever we can, we source organic ingredients. This way, we not only do what is good for the Earth, but we also ensure our ingredients are of the highest quality. It’s about finding the very best, in a way that is good for all of us’ says the Belgian entrepreneur, writing on his own website. This philosophy influences every part of the way Le Pain works, from the food served to the design of the stores, to the materials used to build it. Speaking at a recent MCT summit in Istanbul, he proudly told me how they use reclaimed wood and recycled gypsum, energy-efficient lamps, and environmentally friendly cleaning supplies. The ‘communal table’ is the centre piece of each bakery-café-restaurant (it’s difficult to say which it really is). ‘Without this table we would not be where we are today,’ says Coumont. Believing that food is only as good as the people who share it, he adds ‘a big table is like a good movie; the setting is not the only criteria – the actors are also important’. Whilst Starbucks has modernized and multiplied the Italian coffee experience, and McDonalds has tried to bring some humanity and goodness to its plastic formats, Le Pain is the real thing. Authenticity, a sense of goodness, a natural and human experience, pervades each of the 200 locations in 20 countries. Each serving big Belgian bowls of hot coffee without any handles.